Gemstone identification can be a hard problem, and getting it right is crucial for the people who make their living buying and selling gems. Even dealers with years of experience in the trade turn to gemological labs for help when they need to be sure that a valuable stone is natural and untreated. 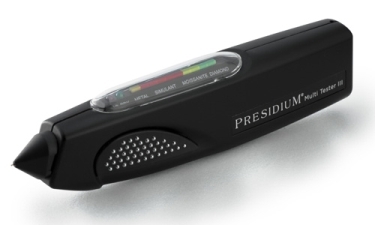 Recently electronic gem testers have come on the market that promise to simplify this problem for the dealer, the retail jeweler and the consumer. These are small hand-held gadgets with a small probe that is placed against the gemstone. But there are many misconceptions about what these testers can and cannot do. These products first entered the market as diamond testers, and helped to solve the problem of distinguishing natural diamond from cubic zirconia, a synthetic diamond simulant. These testers worked by detecting a distinctive characteristic of diamond -- it is an extremely good conductor of heat. This property has been known for a long time and was the basis of one of the oldest tests for diamond: touch a diamond to your lip and it will feel cold. Since diamond is an exceptional thermal conductor and cubic zirconia is not, the first diamond testers used a heated probe to detect heat dissipation. They were very effective at distinguishing natural diamond from cubic zirconia. But then another diamond simulant called moissanite entered the market, and the diamond testers were not able to detect it, since moissanite was also a very good thermal conductor. Another test, using electrical conductivity, was devised to distinguish moissanite from diamond. The latest diamond testers on the market now include both thermal and electrical conductivity tests. While diamond testers have been fairly successful, attempts to use this technology to detect colored gemstones have not fared nearly as well. The colored gemstone tester is diffidently called a "colored stone estimator" by the leading manufacturer of these devices, since thermal conductivity is not a very effective way to identify colored gems. 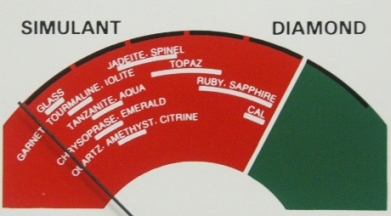 As you can see from the display above, there are overlapping ranges for thermal conductivity for many common gemstone types, and this device cannot clearly distinguish sapphire from topaz, or amethyst from tanzanite or tourmaline or garnet. It may be able to identify glass in most cases, which is a useful function, but it cannot be relied on for gem identification. The most serious limitation of these devices is that they are unable to distinguish synthetic from natural gemstones. A synthetic sapphire has the same thermal conductivity as a natural sapphire, since they are similar chemically. Since the electronic testers are unable to do the basic job of gem identification, we cannot expect them to be of any help with the more challenging questions of gem treatments. There is still no substitute for gemological science and the sophisticated instruments used to measure the optics and spectrometry of gemstones.